My food spirit animal is a croissant. Words cannot express my love for this buttery and flaky French crescent-shaped pastry. It’s usually eaten for breakfast, but really anytime is a good time for a croissant. It’s the one food that turns me into a ravenous beast where time stands still. No one and nothing can interrupt me while eating an exquisite croissant and heaven forbid anyone reach in and try and snag a piece! Just imagining it makes me mad. Where my croissant obsession began, I can’t remember. What I will remember, until my dieing day, is walking the rainy streets of Paris eating a Pierre Herme Croissant Ispahan. A rose flavored almond cream and lychee filled croissant with candied rose petals. I made noises while eating it. Loud and obnoxious noises that came from somewhere unknown. It’s embarrassing, but there’s no shame nor regrets. 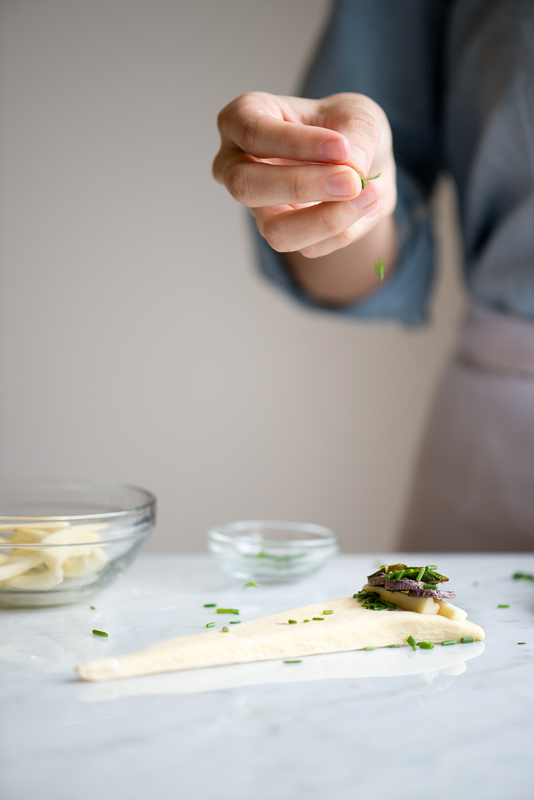 One day we’ll make them together here in this space, but today we’re strolling over to the savory side of pastry with these Purple Potato, Asparagus & Havarti Croissants. Last week was April’s first installment of the Now, Forager brunch series. We had a nice chat about Vienoisserie. Baked goods that are yeast-leavened and highly enriched doughs. 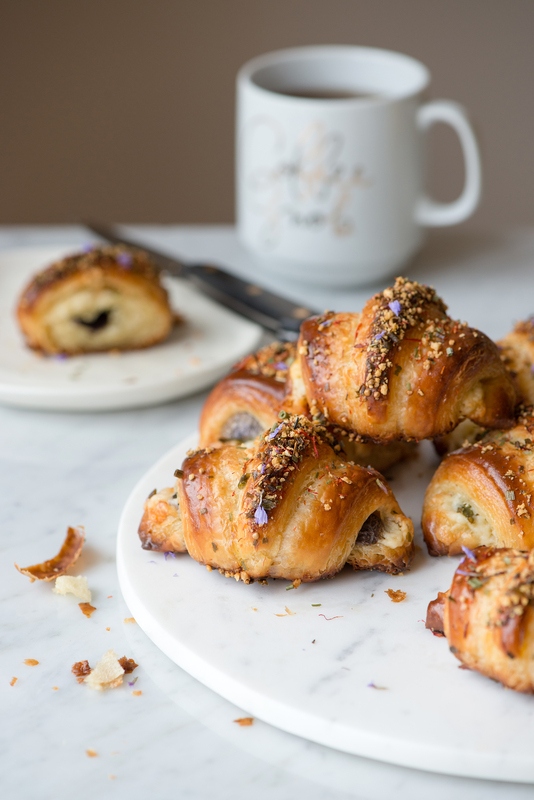 We learned that croissants are the cornerstone to Vienoisserie and that’s why this week I’m bringing you the no-holds-barred savory stuffed croissant. These croissants are crazy good. Stuffed roasted purple potatoes, spring asparagus, fresh chives and melted havarti cheese. They’re finished with a topping of colorful dry herbs including safflower petals. The croissants are vegetarian since my husband is a life-long vegetarian. It seemed cruel to design them to be filled with meat, fill the house with their intoxicating aroma and then sit in front of him devouring something he couldn’t (wouldn’t) eat. If you’re an omnivore, like myself, then add any of your favorite meats to these in your next croissant making endeavor. Another happy aspect to these croissants is that they can be frozen after baked. That means any leftover croissants can be stored in the freezer and then pulled out each morning and refreshed in the oven until crisp. A quick and easy breakfast on-the-go with your morning coffee. I’m telling you, these croissants are worth it and making them is a special experience. As with most new experiences outside of our comfort zone, croissant making can seem intimidating. Croissants are labor-intensive to make; however, the outcome is so immensely rewarding that it completely outweighs the time consuming effort. Once you make one batch it’s all up hill from there. Every following batch will be that much easier and soon you’ll be a croissant-making machine. For now, I’ll provide you with some tips to help you avoid the common pit-falls and frustrations when making them at home. 1. 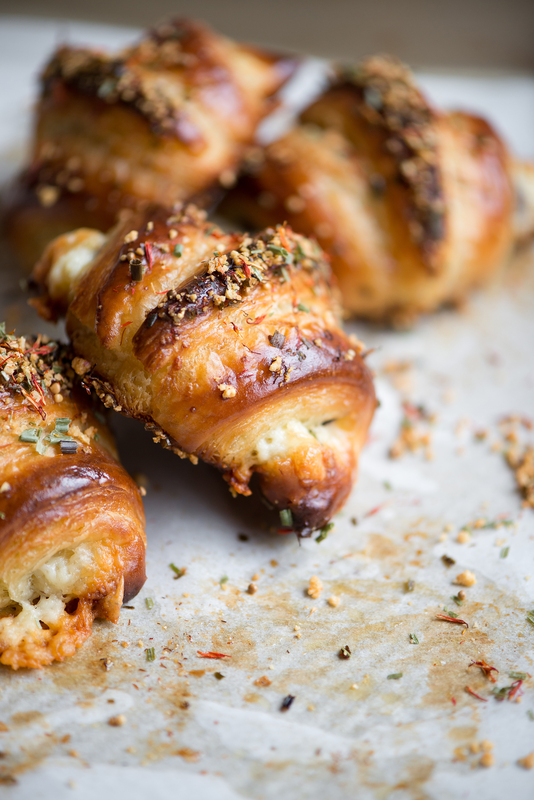 Make these croissants over a three day period. This recipe is written to show the process divided up amongst three days. First day, make the preferment for the dough. Second day, make the dough and roll in the butter (lamination). Lamination is the term used for rolling the butter between the layers of dough, which results in separated flaky baked layers. On the third day, fill and baked the croissants. Read through the instructions to make note of each days dough resting times in order to plan accordingly. 2. Don’t overmix the croissant dough. The dough will be rolled out several times, after the initial mixing, which will further develop the gluten structure in the dough. Too much mixing results in a tough croissant that’ll stale more quickly. You want a smooth dough, so the less mixing the better. 3. Use the right butter. Very important. It effects the croissant-making experience and textural outcome. Croissants are the time to invest in that slightly more expensive European butter. Kerry Gold is an excellent choice, as is Plugra. Choose anything with at least an 83% butterfat content. The European butter will blend into a pliable mass more smoothly. The lower content butters are more difficult to break down and you’re more likely to end up with unwanted chunks of hard butter that tear through the dough. Also, since European butter has less water it’ll remain solid for a longer amount of time in the oven resulting in more croissant layers. 4. Pay attention to the temperature of the butter when spread and rolling it into the dough. At no point do you want soft or melted butter. If it starts to feel too soft, transfer it all to the refrigerator to firm up (not harden). 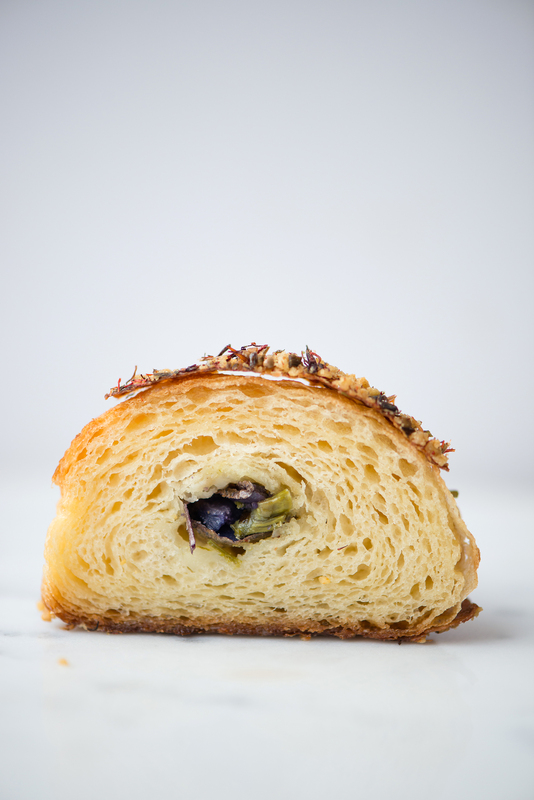 What creates the flaky layers in croissants is that solid butter that’s trapped in between all the layers of dough. While it bakes, the steam released from the melting butter puffs up the dough layers. The dough layers cook and set, leaving behind the empty air cavity where the butter once existed. If the butter is too soft when laminated in, then it’ll melt too quickly in the oven and the dough layers won’t have time to puff up. They’ll just stick together and you’ll end up with bread. Work quickly and don’t fuss too much with the dough. 5. Finally, croissants made at home will not be exactly the same as the croissants that you buy at that amazing famous neighborhood bakery or from France. The bakers who work there are professional experts at lamination. They’ve dedicated their working lives to learning how to make the best croissants every single day. Their shops have access to professional laminating equipment and convection ovens that can reach screaming hot temperatures. Both of which help to create the most beautiful and perfect large-air pocket croissant layers. We love those places. Please buy their croissants regularly. However, it’s a rewarding life experience to learn how to make croissants at home. They’ll taste amazing because you put your heart into them (plus, they actually do taste amazing). They’ll be perfect and beautiful. For the Preferment (Day 1): Gently heat the milk, in a small pot or in the microwave, until milk is no longer cold to the touch (80F-90F), but not warm or hot. Pour the milk into a small bowl, sprinkle the yeast over the surface and stir to dissolve the yeast. Add the flour and mix until a smooth batter forms. Cover the bowl with plastic wrap and place in the refrigerator to rise overnight. For the Croissant Dough (Day 2): In the bowl of a stand mixer, using the dough attachment, add the preferment and yeast. On low speed, mix until yeast is incorporated into the preferment batter, about 1-2 minutes. When the mixture is thoroughly combined, increase the speed to medium and mix for 2 minutes more. Slowly add half of the milk and continue to mix until fully incorporated. Stop to scrape the sides and bottom of the bowl with a spatula as needed to help incorporate the milk. Reduce the speed to low and add flour, sugar, salt, melted butter and the remaining milk. Mix until a loose dough forms, about 3 minutes. Turn off the mixer and allow the dough to rest for 15-20 minutes, loosely covered with plastic wrap. On low speed, mix the dough until smooth and elastic, no more than 4 minutes. If the dough is very firm, add 1 tablespoon of milk at a time to loosen it. Try not to overmix the dough, which will result in an over development of gluten that results in a tough croissant that stales more quickly. Cover the bowl with plastic wrap and let the dough rise until increased in size by half, about 1 1/2 hours. Lightly flour a work surface and transfer the dough to the surface. Press into a rectangle 2-inches thick. Wrap rectangle in plastic wrap and place in the refrigerator to chill for 4-6 hours. For the Roll-In Butter ‘Lamination’ (Day 2): 1 hour before laminating the dough, place the butter in a mixer bowl fitted with the paddle attachment. On medium speed, mix butter until smooth and malleable but not warm or soft, about 3 minutes. Stop and scrap the paddle and bowl as needed using a spatula. Remove the butter from bowl and wrap in plastic wrap. Place in the refrigerator to chill, but not harden completely. Transfer the chilled dough to a lightly floured work surface. Roll out into a rectangle 28-inches by 12-inches. With the long side of the rectangle facing you, starting from left to right, spread and spot the butter over two-thirds of the length of the rectangle using your fingers or offset spatula. Cover the entire surface of the two-thirds of dough evenly with butter. Alternate way to spread on the butter: Unwrap the butter from the refrigerator and place between two large pieces of plastic wrap. With a rolling pin, press the butter out into a loosely shaped rectangle 12-inch by 17-inch. Don’t overwork the butter or it’ll become soft. Remove the top layer of plastic wrap and place the butter-side down onto the two-thirds of dough, making sure to align the edges. Use an offset spatula to clean up the edges and spread butter evenly. Leave 1/3 of the right side without butter (bare). Fold the unbuttered third of dough over the butter (fold to the left) and then fold the left-hand third over the center (fold to the right), as if folding a business letter. With your fingers, pinch down all the seams to seal in the butter. Rotate the rectangle a quarter turn so that the end seams are to your right and left (long side of the dough facing you). Again, roll out the dough into a rectangle 28-inches by 12-inches. Fold into thirds in the same manner (business letter style). Wrap rectangle in plastic wrap and place in the refrigerator for 1 1/2 to 2 hours to the relax gluten before making the final fold. Transfer the chilled dough back onto a lightly floured surface. Again, roll out into a 28-in by 12-inch rectangle and fold into thirds (business letter style). Dough should now be about 9-inch by 12-inches (1 1/2-inches to 2-inches thick). Wrap in plastic wrap and place in the freezer to chill for at least 1 hour. If you plan on making the croissants the next morning, transfer the frozen dough to the refrigerator the night before. Dough can be frozen for up to one week, just transfer to the refrigerator the night before you plan to use it. For the Croissant Filling and Shaping (Day 3): Transfer the chilled dough to a lightly floured work surface. Roll out into a 32-inch by 12-inch rectangle, about 3/8-inch thick. 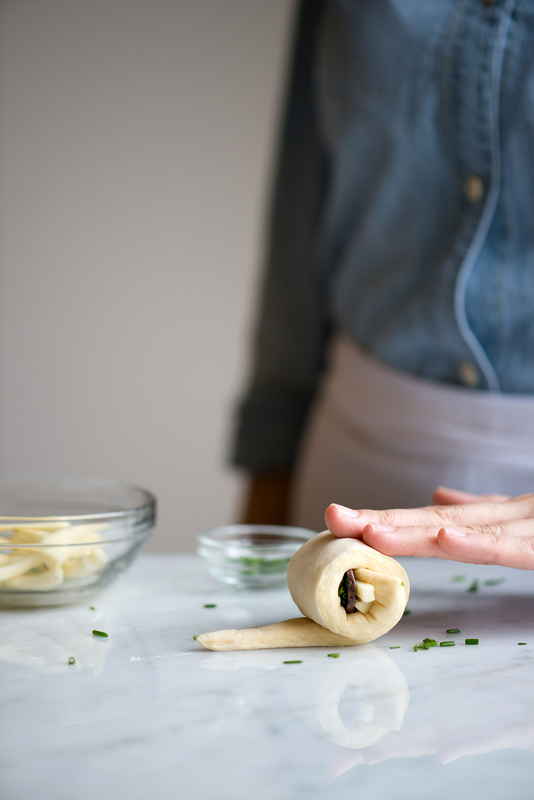 Using a chef’s knife, cut the dough in-half lengthwise (horizontally). You’ll end up with two 32-inch by 6-inch rectangles. Cut the dough into triangles that measure 2 1/2-inches wide at their base (use a ruler to measure out the bases as you go if needed). Line four large baking sheets with parchment paper. To fill and shape the croissants, position a triangle with the base facing you. With your finger tips, gently stretch the base ends to widen a little. Along the base, place two pieces of havarti cheese. Top with a heaping teaspoon portion amount of roasted purple potatoes and asparagus (shingle the potatoes in a single layer across the cheese). Sprinkle on fresh chives over the potatoes and asparagus. Carefully roll up, encasing the filling, and roll the base towards the point of the triangle. 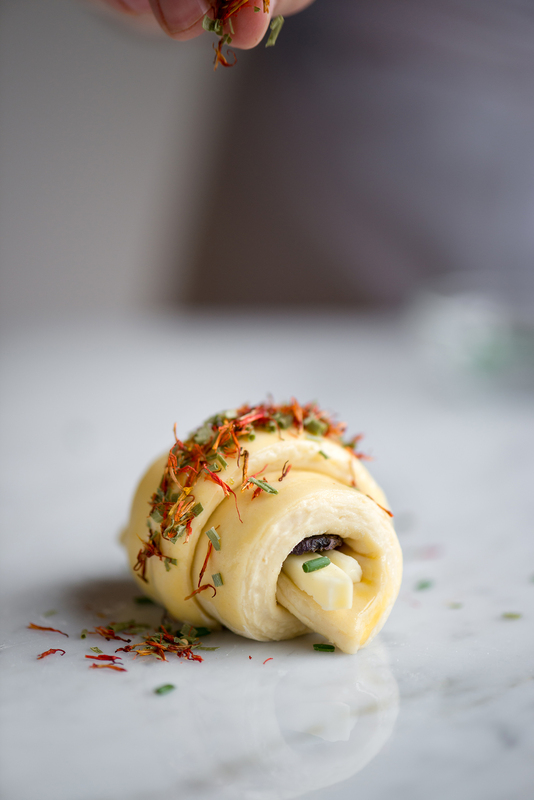 To finish, grab the point with one hand, stretching it gently and tuck it under the rolled dough so that the croissant will stand tall when place on the baking sheet. 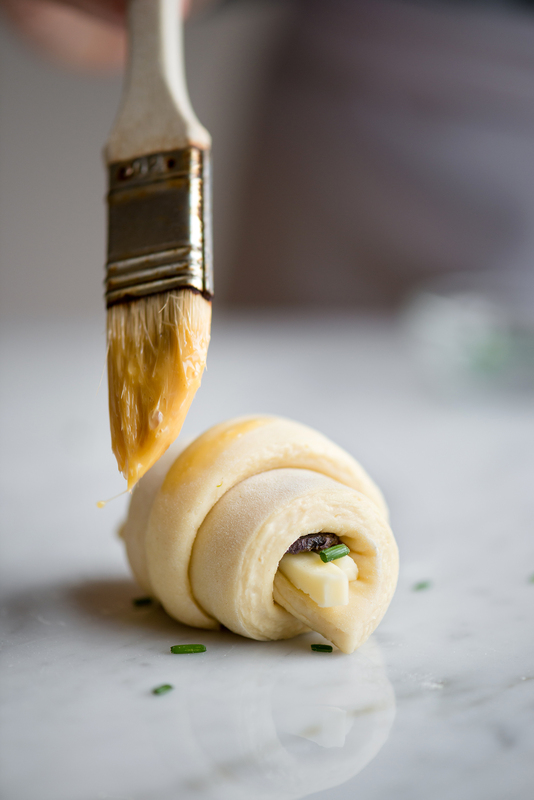 Place rolled croissants onto lined baking sheets, spacing about 2-inches apart. Loosely cover the croissants with plastic wrap and let rise, at room temperature, for 2 to 3 hours. A cooler room temperature environment is preferable to a warm one (which can melt the butter and yield a greasy pastry). Croissants should at least double in size and look noticeably puffy, yet still slightly firm to the touch when ready. Preheat the oven to 425F. Prepare the egg wash by whisking together all the ingredients. About 10 minutes before baking the croissants, using a pastry brush, gently brush the egg wash onto the croissants. Try not to let the egg wash drip or pool onto the pan. 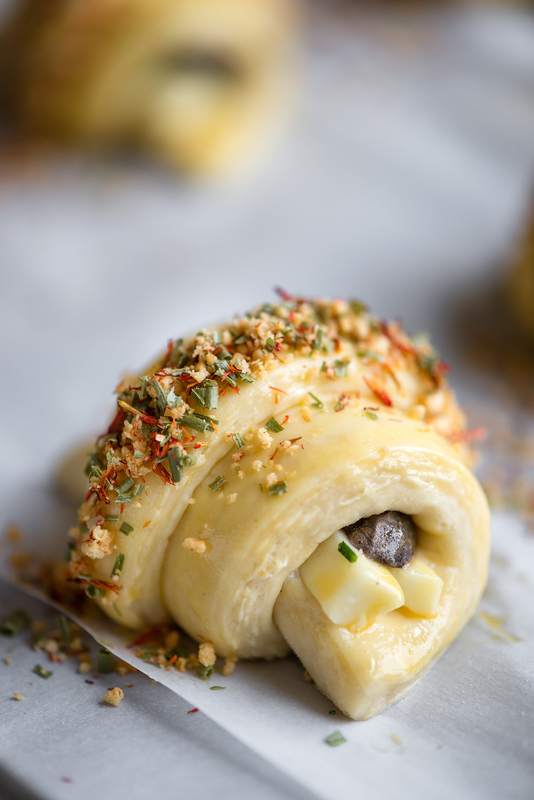 Generously sprinkle on the dry herb topping onto the center croissant ridge. Let wash dry slightly for about 10 minutes. Place the croissants into the oven and immediately turn down the oven temperature to 400F. Bake for 10 minutes, then quickly open the oven door and rotate the pan 180-degrees to help the croissants bake evenly. Bake for another 6-10 minutes more until croissants are deeply golden brown. Repeat the process until all croissants are baked (remember to reheat the oven to 425F between each batch and then lower to 400F when you put each in to bake). Remove croissants from the oven and place on a cooling rack. Sprinkle on some more fresh dry herb topping. Croissants are best enjoyed fresh and slightly warm. Store leftover croissants in an airtight container for 1 day at room temperature and up to 3 days in the refrigerator. Leftover cooled croissants may also be stored, in an airtight plastic bag, in the freezer for up to two weeks. Refresh any leftover croissants in a 375F oven, for 5-8 minutes (12-15 minutes for frozen croissants) until crisp. Croissant dough recipe adapted from Tartine by Elisabeth M. Prueitt & Chad Robertson. In a clean bowl, combine all ingredients together until vegetables are evenly coated. Spread out into a single layer on a baking sheet. Roast for 15-20 minutes, stirring halfway through, until tender and crisp. Remove from oven and allow vegetables to cooling completely before using. In a small bowl, combine all topping ingredients together and set aside until ready to use. *Note: All dried herb toppings can be found at Whole Foods or other specialty grocery stores. Parmesan crisps can be homemade (shredded parmesan that’s baked until golden and crisp) or store bought. I still have croissants on my to do list but this flavor combination is unheard of. Photos came out excellent, like you want pick one and eat. Hi Suchi! Thank you for your kind words and I’m glad to know that you enjoyed this post. 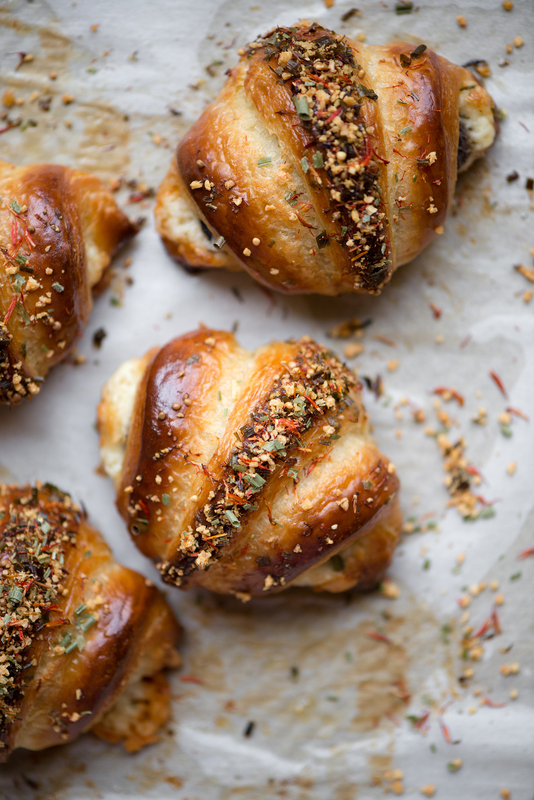 You should definitely give making croissants at home a chance. It’ll be a fun experience with delicious results. Thanks for stopping by! Hi! I’ve discovered your beautiful blog through Instagram and you can’t imagine how I’m enjoying it 🙂 Dreaming on try one, two…a lot of your recipes! This croissants are a wonderfull candidates…but I can’t stop read all the recipes, looking your amazing photos and admiring your work…Thank you very much for share it!